Kolkata: Looking at the ramshackle building and the heaps of garbage lying around, you wouldn’t believe that this was the first Chinese restaurant, not just of Kolkata but the country. Or that it was once the haunt of the wellheeled and famous hub of a bustling community. walk up to it without stepping on faeces and rotting filth. The overpowering stench in Blakburn Lane makes it impossible to imagine the violin notes that once wafted through it in the evening. Nanking — a favourite with stars like Raj Kapoor, Dilip Kumar and Sunil Dutt — shut down long ago. The building is now dwarfed by skyscrapers all around. 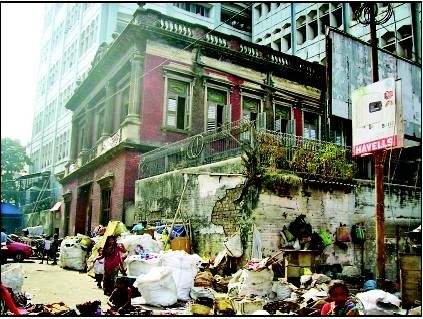 The inevitable assault of modernity wasn’t as damaging as Kolkata Municipal Corporation’s insensitivity. The civic body built two huge garbage vats on either sides of the building — although the church exists — and allowed squatters to settle on the footpaths. For years, an open garbage dump stood at the entrance to the lane. Instead of doing away with it, KMC built another one next to Toong On church. The trustees and the Kolkata Chinese community strongly objected to it. Banners strung up in the lane lament the desecration of the community’s heritage. But it failed to move KMC. Local councillor Rena Khatoon said: “We are trying to keep the place clean and will remove the vat if we find an appropriate place.” The vicinity of a place of worship is not “appropriate” either, says the Chinese community. A tiny shanty colony has come up behind a garbage pile. A public toilet hides the rubbish and their illegal existence from public view but can’t mask its unbearable stench. “We kept requesting the local councillor to keep the doorway of the church free from garbage. Some days the stench is so horrible that we cannot sit here for a minute,” says Li Han Kuang, secretary of Toong On church. Nanking restaurant, which was on the ground floor, closed down in the ’70s. But the Toong On church has been kept alive by the community that has dwindled to just 14. Their ancestors migrated from Toong On county in Canton province of China during the first world war and settled in Kolkata. “Our dwindling number has not robbed us of strength to fight to save our heritage. The 1912 building was almost put on sale at point of time. Au Yau Wah, grandson of Nanking restaurant founder Auyue Shoon tried to sell it but we moved court and saved it,” says Kuang, a retired sailor. The city civil court imposed Section 144 at 22 Blackburn Lane, ordering that Au be barred from leaving the country. Kuang said that the Auyue family was very powerful and the elders of the Chinese community allowed him to open the restaurant purely on trust in 1924. He spoke English and was a police officer. But after his death, his descendants failed in business, said Kuang. Au Yau Wah died from a massive heart attack and it was the end of the restaurant. The church now houses the warrior god Kwandee, holding a big knife. Kuang recalled seeing spears and scimitars hanging on the wall on the first floor and a Buddha bust on the ground floor. 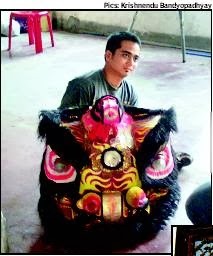 He alleges that Wah not only sold the property that belonged to the Toong On Church but also vandalized the temple with its intricately carved altar and antique furniture. “The furniture is a century old. 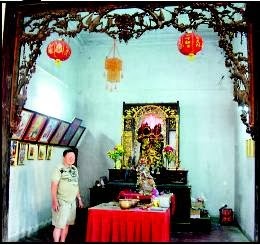 The people who have taken over the church have removed everything,” said Kuang, adding that cubicles with shutters had been built, possibly in preparation for opening shops.